The capitals on “public opinion” and “come out” are deliberate and they emphasise significance. Public opinion is often homophobic and, even for adults, there is still an instinct to seek approval and support from parents. The narrator acknowledges that it’s a high-stake question and the consequences of not being given permission would be devastating. of powerful thighs on the wedding cake altar. dust through a blue, suddenly opened door. The poem’s energy suits its theme of rebellion and non-conformity. There are consequences to crossing the boundaries of behavioural norms, but the guardian angel is a reminder these will be short-lived and the narrator can then be herself. The angel is comforting, a cheer-leading mother-figure to someone who feels like an outsider, not just due to religion but also because of adoption and sexual orientation. ‘Jail Break’ considers the disadvantage the narrator inflicts on herself by slowly learning Dutch whilst living in Amsterdam. The poem explores the world of non-verbal communication with a sense that boundaries can be overcome. ‘Sleeping together’ explores a long-standing love drawing on the idea that swans mate for life. then not only our days acquire patina. There’s a tenderness here that anyone can relate to. It explores the mundanity in love that’s gone beyond the heady days of romance and endured. 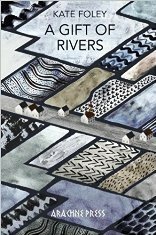 The poems in A Gift of Rivers start in the commonplace, but apply a forensic eye to explore an idea with as much curiosity and care as a historian or archaeologist would give to an artefact. This, combined with an understanding of craft and narrative, makes the poems satisfying. Emma Lee’s most recent collection is “Ghosts in the Desert” (IDP, 2015), she co-edited “Over Land, Over Sea: poems for those seeking refuge,” and blogs at http://emmalee1.wordpress.com.